We had a pretty good month! Nothing too out of the ordinary. We overspent our grocery budget but it was made up for by underspending in a few other categories. Our trip to Boston wasn’t very expensive at all and we got a bunch of great experiences out of it so it was high in value. 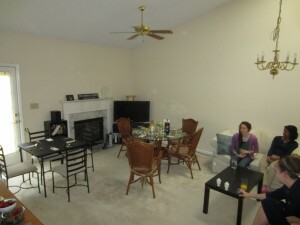 We had more side income than we usually do. Our cash is getting really, really high, people! I wish we would go ahead and repair my car so we would know how much it will be so we can reallocate some of our Cars savings elsewhere. I feel like I want to go a bit crazy and just spend a few thousand dollars on a vacation. 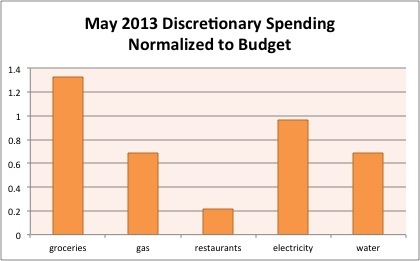 You can compare our spending in May below to our budget. GIVING: Our usual 10%+ to our church and $50 to the missionary we support. Cell phones: Kyle’s usual $69.60; due to receiving my first credit to my Republic Wireless account, we only paid $3.25 this month! Groceries: Ugh ugh ugh over again. Maybe we will balance out within budget or maybe not. I’m not sure how to even this out. Gas: Two fillups this month (sense a pattern?) so well under budget here. Restaurants: We were very low on spending here – Kyle has only bought one drink and one meal at a quick restaurant. We went out a few times during our trip to Boston but that was covered by our Travel account. Electricity and Gas: Our temperate spring has kept our A/C costs down – not sure for how long! We spent $10.72 on light bulbs. This month we spent $731.87 out of these accounts and saved $110.33 above our usual rate. We added $62.33 to this account from our side income division. We used $146.59 from this account to reimburse our Boston trip expenses. We transferred four weeks of CSA payments ($12 each) into this account to reimburse ourselves. We paid six months of car insurance for our primary vehicle for $357.85 – a LOT less than last time! We paid for our $63 Duck Tour tickets on our Boston trip from this account. We also finally paid our Bursar account balances, which included $10 for our grad school prom from several months ago. I spent $40 on a haircut and $11.85 on dry cleaning. We moved $50 from this account to our Nest Egg to repay ourselves for our smartphone purchases. Received $50 from our Electronics account. Kyle bought a toy (a drum controller) for $75, and since our Electronics account is still repaying this account for our smartphones we used money from this account to buy it. It will just add another 1.5 months of repayment from our Electronics account to this one! We added $27.58 to this account from our side income division. None this month! We’ll probably be in a holding pattern until we know where and when Kyle is moving. Bottom line: We came out $22.05 ahead of our bottom line this month, so I transferred that amount from checking to our Travel savings account. How was your spending in May? Have you started traveling for the summer yet? What budget category has given you consistent trouble recently? 9 Responses to "May 2013 Month in Review: Money"
You gotta love those Republic Wireless credits. Are you getting a lot of those. Yours was certainly the first RW post I saw on the blogosphere. I’m not sure how it worked, but a day or two after I wrote my review I got the referral link. I don’t know if that was coincidental and they had just created the link for everyone or I only got it because I had written a review (which RW had picked up on Twitter). I wish I’d had it before I wrote the review because it generated mondo traffic that day! I’ve gotten between 8 and 10 signups from my link so far and about 3 have lasted the 30 days to date (100% of eligible). At the time I wrote our review, I hadn’t read any personal reviews of RW, just the ones generated by the big blogs about the stats of the service, so it may have been one of the first or at least the first in the PF blogosphere. Mrs PoP @ Planting Our Pennies recently posted..Are You Overpaying For Prescriptions? It’s good you have that lead time, though, to prepare for the expense. I’m impressed with the low cost of your CSA. We did something similar here for about a month last year but it was far more expensive than we wanted and we ended up stopping the subscription. 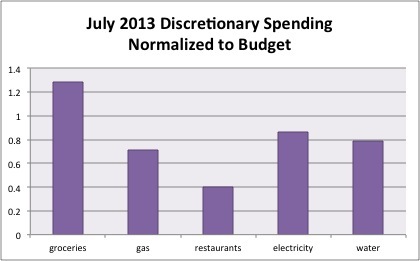 Our food budget was pretty high this month, but we evened out the budget by saving on entertainment costs. We have an “individual” share so we might be getting less produce than you do! Overall the price is more expensive than the same foods in the grocery store, but not by a ton and we think it’s worth it. Good job keeping to plan 🙂 Our month was pretty close. Some extra visitors this month so we were a little over on food as well. I wish our hospitality food spending wasn’t part of our normal grocery budget! It doesn’t always work out 100% this way, but we have a seperate fund that is used for travel/christmas/larger hospitality items. Since I get paid bi-weekly I get two extra paychecks a year. One of them goes towards this fund, and the other goes towards property/car insurance and property taxes. We try to do a rough plan of what we are spending these on each year, as we tend to plan most vacations and holiday time negotiations (between both families wanting us) a year ahead of time. So we have a couple “siblings visit for the weekend” items in our plan that we know will happen, but just not when. We are usually pretty close, but just having someone over for dinner once usually isn’t in the plan and so that comes more out of our normal food budget.